I know there is something somewhere that says that when we do a good deed, we are not supposed to brag about it. Its not meant to be a show or an act. And we definitely aren’t supposed to make sure others know what we have done…. We just do it. Its all about taking care of someone who has greater needs than oneself. Complete selflessness, based solely on the actions of her heart, not pride. I love catching these moments as they happen. For the record, this is found in Matthew 6:1 " Be careful not to practice your righteousness in front of others to be seen by them. If you do, you will have no reward from your Father in heaven." I'm blessed enough to spend my life with someone who does this - often - without a second thought. It is my constant reminder that I need to care less about myself and more about others. Especially those with greater needs than I... Or who need a reason to smile. Big or small. 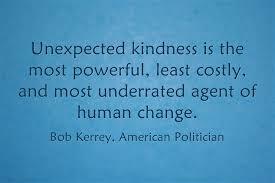 I remember learning about "Random Acts of Kindness" while I was in high school and thought - what a GREAT concept!! I mean, who wouldn't find satisfaction in following through with a selfless, random act that can brighten someone's day? Truth is, its a great idea, a great thought, it makes us pause for a moment...but how many of us actually perform these acts? Check this out... Last year, a Starbucks in St Petersburg, FL had a chain of random acts of kindness that lasted about 10 hours, with assistance from approximately 450 customers. It took one drive-thru customer to make the decision to pay for the order of the car behind them.... and the chain continued on and on and on.... for all of those TEN HOURS! Or how about this girl here ... she made a promise to complete 600 random acts of kindness in honor of her deceased grandmother. Or the diner who left a large tip so the server could show off a new smile --- with a chance at dental work! - clean out your closet and donate your clothes. - secretly pay the tab of another diner at a restaurant. - offer to help someone...with a ride, tutoring, babysitting, etc. - leave extra time on your parking meter. - leave a small gift or baked good on someones doorstep.